We’d love your help. Let us know what’s wrong with this preview of Salt by Helen Frost. Anikwa and James, twelve years old in 1812, spend their days fishing, trapping, and exploring together in the forests of the Indiana Territory. To Anikwa and his family, members of the Miami tribe, this land has been home for centuries. As traders, James's family has ties to the Miami community as well as to the American soldiers in the fort. Now tensions are rising—the Br Anikwa and James, twelve years old in 1812, spend their days fishing, trapping, and exploring together in the forests of the Indiana Territory. To Anikwa and his family, members of the Miami tribe, this land has been home for centuries. As traders, James's family has ties to the Miami community as well as to the American soldiers in the fort. Now tensions are rising—the British and American armies prepare to meet at Fort Wayne for a crucial battle, and Native Americans from surrounding tribes gather in Kekionga to protect their homeland. After trading stops and precious commodities, like salt, are withheld, the fort comes under siege, and war ravages the land. James and Anikwa, like everyone around them, must decide where their deepest loyalties lie. Can their families—and their friendship—survive? In Salt, Printz Honor author Helen Frost offers a compelling look at a difficult time in history. what is anikwa dad name? Besides the Anne of Green Gables series, I haven't really dipped my toes into historical fiction that is geared toward the children's audience. This book was a neat introduction into that genre. Set in 1812 in the Indiana territory around Fort Wayne, two boys from two different worlds have a thriving friendship, free of any prejudices or political loyalties. James is the son of a family of settlers who run a trading post outside of the fort, and Anikwa is a young boy from the Miami tribe, who hav Besides the Anne of Green Gables series, I haven't really dipped my toes into historical fiction that is geared toward the children's audience. This book was a neat introduction into that genre. Set in 1812 in the Indiana territory around Fort Wayne, two boys from two different worlds have a thriving friendship, free of any prejudices or political loyalties. James is the son of a family of settlers who run a trading post outside of the fort, and Anikwa is a young boy from the Miami tribe, who have lived on the land for hundreds of years. When war comes to the area, the boys' friendship is tested, especially because of conflicting opinions from the various adults and children within their circles. Probably off topic, but this book reminded me of how history continues to repeat itself. Everywhere in the world where there are wars or rebellions, there are always two conflicting sides. The stories that are not often told are of those that remain neutral, or see good and bad on each side. I can't help but think of Hutus who hid Tutsi neighbors, risking the lives of their families in order to do the "right thing" during the Rwandan genocide. Likewise in Nazi occupied Europe, when many of Hitler's targets were given shelter and hiding places until the end of the war. This review was written for LibraryThing Early Reviewers.This is the first book I have ever read about the War of 1812, and so it provided some interesting insight to that period of history. This story would be great read (or listened to) in the classroom. It is told from alternating points of view between a 12 year old settler and a 12 year old Indian. It is not too heavy on historical names, dates, or details, but focuses more on the events as perceived by the two boys. Peace is not an awful lot to ask"
maple sugar. And then a copper pot. The fiddle that belongs to Old Raccoon. Pa, I ask, who gave this to you? He answers: No one. They've all gone away. and we wait for him to tell us what's happening. Ma keeps coughing. Her eyes are all red. Might be from the smoke, but it's also from crying. to fight this war! Pa nods. I know that. You know that. I couldn't stop them, Lydia. I ask, How will they make new houses before winter? Pa mutters, That is the idea." In reading SALT: A STORY OF FRIENDSHIP IN A TIME OF WAR, Helen Frost's verse novel about a pair of twelve year-olds living in the shadows of Fort Wayne in 1812, I have lost some respect for President James Madison. Madison, when he was in his thirties, was instrumental in the drafting of the U.S. Constitution; was an author of The Federalist Papers (which were key to gaining state-by-state ratification of the Constitution); and was then also responsible for drafting the Bill of Rights -- the first ten amendments to the U.S. Constitution. Truly amazing guy and Founding Father, right? But I believe that the Commander in Chief is ultimately responsible for what happens "on the ground" in a war, and I cannot imagine that the atrocities perpetuated against the fictional members of the Miami tribe we meet here, who lived near Fort Wayne, and perpetuated against Mother Nature, as we also learn in this tale, were unique occurrences during the War of 1812. Helen Frost has spent a lot of time researching the historical background for this story, so you can bet that this stuff really happened. And so, in my eyes, Madison, who was President from 1809 until 1817 becomes one more wealthy slave owner, albeit a brilliant-minded, wealthy slave owner, who became President and let American troops run amuck. "You break it, you own it." I said this about George W. Bush and his wars. I think it's logical that I hold James Madison to the same standard. Now, I need to make it very clear that President James Madison is not part of, nor ever mentioned in this story. But I was so caught up in the guy friendship aspect and then so moved with grief in reading the later portions of this historical fiction story, that I found myself pondering at length about who was responsible for what happens here. What this story is about are those two aforementioned twelve year-olds from whose points of view the story is told. Anikwa is a member of the Miami tribe living in the village called Kekionga, close to Fort Wayne. James Gray is the son of the owner of the trading post that is situated within the stockade adjoining the Fort. The two boys are good friends who frequently hang out together, and there is such richness in their intercultural connection. The parents know one another through the commerce that takes place at the trading post. This knowing one another leads James' parents to being more enlightened than the other white folks we meet here and, in turn, James is open and trusting of the residents of Kekionga (in sharp contrast to another white boy, Isaac, who we also come to know). Helen Frost always employs fascinating poetry forms in her verse novels. Here, Anikwa's poems are shaped like patterns of Miami ribbon work, while James' poems are like stripes on the American flag. Great historical fiction is well-researched, well-written, moving, and causes one to be interested in further knowledge about the subject. These are all things that make SALT: A STORY OF FRIENDSHIP IN A TIME OF WAR a great piece of historical fiction. This novel-in-verse looks into the past when Native Americans were forced from their lands in the 1800s in the United States. I just happened to have finished the book, How I Became a Ghost , by Tim Tingle about the same topic except specifically, the Trail of Tears. These two books could be compared regarding the Removal Acts of 1830 and how they impacted the Native Americans. They are quick reads. Helen Frost captures the lifestyle of the Miami tribe at Kekionga and the trading post outside F This novel-in-verse looks into the past when Native Americans were forced from their lands in the 1800s in the United States. I just happened to have finished the book, How I Became a Ghost , by Tim Tingle about the same topic except specifically, the Trail of Tears. These two books could be compared regarding the Removal Acts of 1830 and how they impacted the Native Americans. They are quick reads. Helen Frost captures the lifestyle of the Miami tribe at Kekionga and the trading post outside Fort Wayne, Indiana. Two alternating viewpoints between twelve-year-old friends, Anikwa, a Miami boy, and James, a white boy, show two cultures at odds with each other. I got lost in the scenes where the two are trying to communicate and do not know each others language. I can relate with living overseas for the past ten years and having a concrete ear when it comes to learning languages. Some incidents are funny. Some frustrating. The subcharacter, Isaac, captured my attention least. He is one dimensional and used as a foil to show the common prejudicial view toward Native Americans. The two families of Anikwa and James, particularly the males, fluctuate between helping or hurting each other. I do think this plot was an ambitious endeavor and is going to be hard to pull off because it is a complex topic and poetry uses so few words to convey information. I admire Frost's efforts and at times she succeeds and other times falls short. The verse in Anikwa's voice is in the shape of weaving, while James is in couplets. The author explains this in the notes and says that originally, James was supposed to look like the American flag. Side-by-side they look like a blanket in the process of being woven. This image of two cultures intertwined made me think of the modern day mix of ethnic cultures in the United States. Blanket weaving has such a rich history in Native American culture and the long hours put into creating a brightly colored blankets suggests that friendship and peace is possible one thread at a time but will take a time and patience. This is set during a time of war where tensions run high and people are taking sides. Anikwa and James are friends. They fish together and hunt. While they can't speak together, they try to learn words and have an easy camaraderie. The author shows how the Native Americans tried to use appeasement and force against the white people taking their lands. Neither way works and in the end the Miami tribes lose their lands. It suggests that individuals can be friends even in the midst of war and while they can't make a change on a big scale they can on a small one. This week I was particularly frustrated by the Taiwan government. They have had food scandal after food scandal. My husband and I have been drinking contaminated milk for 7 years. At our school, the incidence of cancer is high. To the point that people have wondered what is going on. I suspect tainted food and pollution. When I talk to the Taiwanese they shrug their shoulders and say they can't do anything. But I can do something. I will not buy food from the companies with shady practices. I can get imported foods. By making a personal action I feel like I have a choice. I can't control the government but I can protest as one small voice. If enough of us get together, it will have an impact on these companies. This is the message I get from this book. Even though only two families will not change the outcome of the war, they made a choice. And that choice is for tolerance and peace. 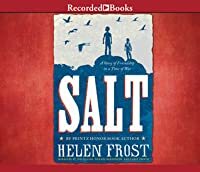 I really enjoyed "Salt" by Helen Frost. "Summary: Twelve-year-olds Anikwa, of the Miami village of Kekionga, and James, of the trading post outside Fort Wayne, find their friendship threatened by the rising fear and tension brought by the War of 1812." I think that it would be a good fifth grade book group book. It is a powerful book, written in verse. "Salt" would make a great addition to a fourth or fifth grade unit. When properly placed into a unit, this book will help meet Common Core Standar I really enjoyed "Salt" by Helen Frost. "Summary: Twelve-year-olds Anikwa, of the Miami village of Kekionga, and James, of the trading post outside Fort Wayne, find their friendship threatened by the rising fear and tension brought by the War of 1812." I think that it would be a good fifth grade book group book. It is a powerful book, written in verse. "Salt" would make a great addition to a fourth or fifth grade unit. When properly placed into a unit, this book will help meet Common Core Standards and allow rich classroom discussion to ensue. "Salt" is written in poem form, alternating the voices of two boys, one Native American, the other a settler. Helen Frost states, "Anikwa's poems are shaped like patterns of Miami Indian ribbon work, a traditional art form created by sewing different colors of ribbons in patterns layered on top of each other to form diamond and triangle shapes. James' poems look like the stripes in the American Flag. " As a rule I don't like novels in verse. I think Frost came pretty close, here, because the verse is well-formed, and there's a reason behind it, as she explains at the end of the book. The spareness suits her authorial voice, too. That said, it was an interesting, well-balanced portrait of a moment in time. It felt fairly even-handed, though too good to be true in spots. I would give this 10 stars if I could! This novel in verse is set in and around S E Indiana right before the War of 1812. It is absolutely perfect for my 5th graders here in SW Ohio. I will definitely purchase multiple copies for our students & teachers to use in their classes. Highly recommended. 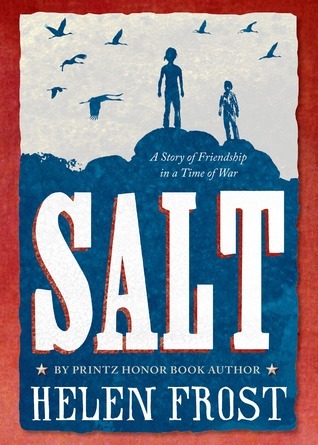 Salt: A Story of Friendship in a Time of War by Helen Frost is a story of friendship that takes place in the Indiana Territory and is happening around the time of the War of 1812. The two are 12-year old boys, James is from the American fort and Anikwa is from the Miami tribe. They love to spend a lot of free time together, exploring the territory of the region, and trying to learn each other’s languages. All of that is about to change when alliances are made between the British and the American Salt: A Story of Friendship in a Time of War by Helen Frost is a story of friendship that takes place in the Indiana Territory and is happening around the time of the War of 1812. The two are 12-year old boys, James is from the American fort and Anikwa is from the Miami tribe. They love to spend a lot of free time together, exploring the territory of the region, and trying to learn each other’s languages. All of that is about to change when alliances are made between the British and the Americans. The Native Americans tribes are uncertain about which side to join, and everybody is getting antsy about it. Salt is a very precious mineral in this battle, it helps to preserve and keep the flavors of the food. James’s father stops trading with Ankiwa’s tribe, because he’s afraid of not having enough salt, and that is making them look hostile to the tribe. James is also told to not trust the tribe, but he try to refuse. The two must learn what values more than their friendship, and trust their instinct to do the right choice. I really enjoyed this historical fictional poem about the War of 1812. It’s a quick and engaging read. The narrative alternates between James and Ankiwa’s first person point of view. The thing I liked most about the book is the format of James and Ankiwa’s narration. James’s words are organized like strips to represent the American flag, and Ankiwa’s words are organized like ribbons to represent Miami ribbon work. Set in 1812, James and Anikwa, both 12 years old, are best friends. James lives with his family at their trading post at Fort Wayne in the Indiana Territory. Anikwa, a Miami Indian, lives with his family and tribe in Kekionga. Their families respect and treat each other like family. However, with war on the horizon, will they be able to trust one another? I loved these characters and their journey. Great introduction to Indian-American relations during this time, especially for those who live in Set in 1812, James and Anikwa, both 12 years old, are best friends. James lives with his family at their trading post at Fort Wayne in the Indiana Territory. Anikwa, a Miami Indian, lives with his family and tribe in Kekionga. Their families respect and treat each other like family. However, with war on the horizon, will they be able to trust one another? Salt, by Helen Frost, is a book told in a poem format. There are two different kinds of poems because every other one is told by a different boy. Anikwa, a Boy that is part of a Miami tribe, and James, an American. But this is during the war of 1812 so the Miami tribe and the fort that James lives near don't trust each other. The trading post at the fort will not trade with them so that means the Miami tribe won't be able to get salt. They need to have salt to survive. Can Anikwa and James help Salt, by Helen Frost, is a book told in a poem format. There are two different kinds of poems because every other one is told by a different boy. Anikwa, a Boy that is part of a Miami tribe, and James, an American. But this is during the war of 1812 so the Miami tribe and the fort that James lives near don't trust each other. The trading post at the fort will not trade with them so that means the Miami tribe won't be able to get salt. They need to have salt to survive. Can Anikwa and James help each other or will their friendship fall apart once and for all? Told in the alternating narratives of two 12 year old boys, Anikwa and James in 1812 from the heart of Indian Territory. Anikwa and his family, members of the Miami tribe, have lived on this land for centuries. James's family are traders and connected to the new settles and solders who arrive in waves to stake their claims in the new frontier. Can their friendship survive the forces at play, the winds of war, and disloyalty? Twelve-year-old Anikwa, a member of the Miami tribe, and twelve-year-old James, the son of white traders, are friends who spend much of their time together in the Indiana territory where they live. When the War of 1812 breaks out, however, they find their families on opposites sides. James's family can suddenly no longer provide salt to the Miami, and many of the other white families are suspicious of the Indians, wondering if they are out to This review also appears on my blog, Read-at-Home Mom. Twelve-year-old Anikwa, a member of the Miami tribe, and twelve-year-old James, the son of white traders, are friends who spend much of their time together in the Indiana territory where they live. When the War of 1812 breaks out, however, they find their families on opposites sides. James's family can suddenly no longer provide salt to the Miami, and many of the other white families are suspicious of the Indians, wondering if they are out to harm their American neighbors. Despite the political firestorm, destruction and violence surrounding them, the two boys remain friends, showing their affection for each other in whatever small ways they can. This novel in verse is well-written, but slow-moving. The narration alternates between Anikwa's poems, written in a format meant to mimic Miami weaving patterns, and James's poems, which echo the arrangement of the stripes on the U.S. flag. Though the poetry is quick and easy to read, the characters come across as very flat. Because all narration is stripped down to spare lines of poetry, there is hardly any personality or sense of humor in either boy's words. It feels odd to read about 12 year old boys who are so serious and introspective, and it makes it hard to connect with the book. There are also poems about salt interspersed throughout the text which don't really add much at all to the story. The reader could essentially skip these and still not lose the thread of the story. There is also a sense of false political correctness about the book's "can't we all just get along" philosophy, which comes across as hokey rather than emotionally meaningful. When kids ask for war stories, this is generally not what they have in mind. Kids would rather read about the excitement of battle than the sincerity of two boys who want to stay friends despite their differences, however important adults find that message to be. As a story, and as a teaching tool, this book is just okay. Kids would have a hard time learning much about the War of 1812 in general from such a narrowly focused story, and the reduction of the war to a relationship between two boys seems like too much of a simplification. I don't have another War of 1812 title on my list for this project, but I will be seeking out others when it comes time to homeschool on the subject. This story is a beatiful example of friendship. It tells the story of two young boys whose lives change as the war of 1812 begins. The boys, one a white settler, and the other from a native tribe called Miami. The story is told in two voices, in prose, with the words on opposite pages. As the boys friendship is tested, you learn about the war from both sides. Pick up this book, it is a great read. Told in verse this is a sad tale of what it was like when American's first settled here. It paints a very true and very scary picture for us of just what it was like back then. Author Frost skillfully crafts a concise snapshot of a period in America just before the War of 1812, deploying her gift of poetry to present twin narratives from the perspective of two boys during that time. Each page in the story switches perspective from one boy to the other; a structure that could be cumbersome, but it works because the two boys voices are well realized. Overall, this is well-researched, well-executed historical fiction that leaves the reader with a curiosity to know more. I think that "Salt: A Story of Friendship in a Time of War" was a beautiful story. I enjoyed it. I was debating giving this book four stars, but I believe that this book deserves five. Two twelve-year old boys are part of different tribes, and they are friends. The tribes are getting attacked, and one of the villages flees. This is probably my favorite of Frost's books. Her 2 male protagonists, 11 year olds Anikwa and James, are realistically created, and the actions are faithful to the history from 1812. Moving, beautifully written and a great read for children 8-14. So far, one of my favorites this year. Glad she shares her perspective. A charming story. I would not read too much philosophy into it, but if the adults were as forgiving as to two boys in this story, the world would be a better place. If you haven't read one of Frost's beautiful novels in verse, you really must. Incredible. Excellent historical novel written in verse set in Indiana during the War of 1812.